Thanks to all that made it out last night to the opening of "Salt the Skies" at FFDG. We're going to clean up, take a breath and get back on it on Monday. 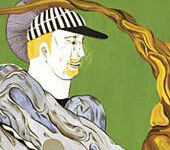 Enjoy your weekend and this great painting "Portrait of a Slugger 19" by Hiro Kurata which is part of the show. 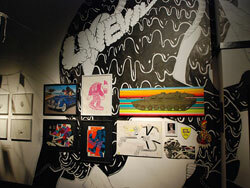 Brooklyn based Hiro Kurata, via Japan, has his London solo show running through Friday, Dec 7th at Ivory and Black. Such wonderful paintings. Here are a few pics from the opening. Brooklyn based painter Hiro Kurata, whose work we love, opened the solo show "This Land Was Your Land" at London's Ivory and Black last Friday. After watching the video, get a better taste of his work here. Love Brooklyn based Hiro Kurata's work. Here's a new one he emailed over. Karma of a Slugger. Brooklyn based painter Hiro Kurata emailed over some recent work. Have been a fan for years as he mixes scenes of allegorical mythologies using descriptive folk art with motif of baseball figures and equipments. 29 yr. old Brooklyn based artist preparing for a February show at Joshua Liner in NYC.